When Trotty’s daughter brings him a happy surprise (tripe and news of her engagement for the upcoming New Year), he is quickly disillusioned by a group of wealthy people who delight in “putting-down” poor folk. That evening, Trotty explores his beloved bell-spire and sees things that he never expected to see. This story was hard to read at first because it was so darned depressing. I mean, here Trotty was as happy as a clam (because we all know clams smile all the time) and suddenly these horrible wealthy men stomp all over his happiness. As the story goes on, the family becomes even more downtrodden. In fact, I was wondering if the story was going to turn around into a happy Christmas story until the very end. This wasn’t my favorite of Dickens’ works. It’s nice to read another of his lesser known Christmas stories, but I guess it’s lesser-known for a reason. It was quaint and a good poke-in-the-eye to the strong who “put-down” the weak. But other than that, it was kind of a “meh” book for me. Same experience here with The Chimes, which I read last year. For this year's Dickens' Christmas story, I read The Cricket on the Hearth which was even more confusing and depressing. I agree, these are likely lesser known for good reason …. 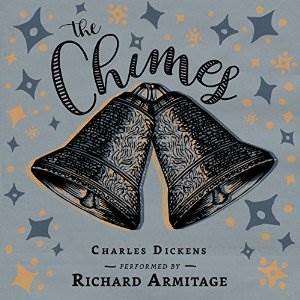 I just read sometime this week, that Dickens wrote three short Christmas tales. I knew A Christmas Carol of course, and the Cricket on the Hearth, but I wondered what the third was. And then you answered the question. Thanks. Yeah, I'll probably try reading The Cricket on the Hearth next year. But thanks for the heads up about it being even more confusing and depressing. I'm usually a huge fan of Dickens. Still, they're short and it's nice to get through the Dickens canon. Actually, there are five of them. The other two are: The Battle of Life and The Haunted Man.